Accounts that were connected before September 15, 2018, will continue to sync as usual until October 30, 2018. On October 30, 2018, all connected accounts will stop syncing email. On November 15, 2018, the Connected accounts option (Settings > Mail > Accounts) will be removed from Outlook on the web . 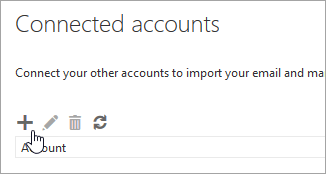 To remove a connected account, see Remove a connected account from Outlook on the web. Use the instructions below if you want to connect an account to your Outlook on the web (work or school) account in Office 365. If you're using Outlook.com or Hotmail.com, see Add your other email accounts to Outlook.com for instructions. If you're using Gmail, first follow the steps in Prepare your Gmail or G Suite account for connecting to Outlook and Office 365, then follow the steps below. Under Options, select Accounts > Connected accounts. Not all features are available in every region. If you don't see the Connected accounts option, this feature might not be available for your account. Under Connected accounts, select . On the Connect your email account page, enter the full email address (for example, MollyD@contoso.com) and password of the account you want to connect to Outlook on the web and select OK. IMPORTANT: If you get a message that Outlook couldn't connect to the server for your other account, select Back and make sure you entered the correct email address and password for your account. If you still can't connect, it's possible that your mail provider doesn't support connecting over IMAP. Try connecting over POP. For instructions, see Connect an email account from an Internet service provider (POP account) below. When a connection is established, you'll see that Outlook is downloading your email. Select Close. Refresh your page after a few minutes to see if the download is complete. Go to the website for your email provider and search for the name of their Incoming POP server. Usually this is something like "POP3.<name of company>.com". Write down this information because you'll need to enter it a few steps later. When you see the Unsecured connection page, select Skip. At Choose your connection type, select POP connection settings > OK.
On the New POP account connection page, enter the email address of the account you're connecting in the Email address box. In the User name box, enter the email address again, and then enter your email password in the Password box. If you want a copy of your email to be saved in your other email service, select the Leave a copy of messages on the server check box. Incoming (POP) server: Enter the name of the POP server that you found on your email provider's website. It should be something like POP3.<name of company>.com. Incoming server port: This is usually 995. Authentication: This is usually Basic. If your email provider specifically says to use SPA, choose that. Encryption: This is usually SSL. Change this setting only if your email provider specifically says to use TLS. IMPORTANT: If you get a message that a connection could not be made, check for typos. If you're still having issues, see Fix problems with connecting an account below. Is there a typo in the password or email name? Double-check. This is a very common problem. Are you trying to connect a POP email account? See the following instructions: Connect an email account from an Internet service provider (POP account). Is two-step verification turned on for your email? If so, go to your email account and turn off two-step verification. If you can't connect, either your email provider or Office 365 might be experiencing service issues. Try connecting again in an hour. If you can't connect even after trying at two or three different times of the day, it's not a service issue. Are you trying to connect a Gmail account? Make sure you've followed the steps in Prepare your Gmail account for connecting to Outlook and Office 365. If it's a corporate Gmail account, check whether it's a POP account. Now look at Outlook on your computer: If your Outlook looks different, you might not be using Outlook on the web. See What version of Outlook do I have? to find setup instructions for your version of Outlook.